Many of us non-white French citizens were relieved when we found out that the 39-year-old centrist Emmanuel Macron did better than the ten other candidates in the first round of the French presidential election. He will face the far-right National Front candidate Marine Le Pen in the May 7 runoff. For the past couple of years, the reality of a President Le Pen in the Élysée Palace has become a recurring nightmare for me, made more vivid in recent months by the populist, anti-immigrant rhetoric of Brexiters and Donald Trump. When Marine Le Pen took over from her father Jean-Marie Le Pen, a perpetually angry firebrand, convicted several times for racist and anti-Semitic statements, as party head in 2011, she undoubtedly widened the National Front’s electoral base. She smiled a lot, blamed globalisation for France’s woes, and talked about giving power to the people instead of Europe’s bureaucrats. As a former lawyer, she has a way with words. Yet, even though she publicised smiling photos of herself posing with minorities from all backgrounds, something her father never would have done, she continued to paint immigrants as lazy villains whose main mission was to take maximum advantage of the generous French Welfare State. And, with the most pernicious kind of us-against-them demagogy, she remained unapologetic about her Islamophobia. How can we love a country that doesn’t love us back? There are more and more French jihadists and radicalised Muslim youth who hate everything about France. Their violent actions have led to rampant Islamophobia and deeper anti-immigrant sentiments. Those feelings are part of the reason why so many young graduates from the banlieues—those working-class suburbs outside Paris—are unable to land the entry level jobs they compete for. These graduates have become vocal about their bad predicament, which they blame on a white ‘system’ that judges them by the color of their skin, or by their Muslim-sounding names. Their latest war stories of everyday discrimination bring back old memories and take me back to my younger self. At times that empathy has made me question the French part of my identity. How can we love a country that doesn’t love us back? I see many expressions of France’s current identity crisis and lack of confidence. I usually tell young graduates who come to me for mentorship (or advice on how to interview for a job) to hang in there and to keep trying; the 25 per cent youth unemployment rate makes it hard for anyone to secure a steady job. I sense their discouragement, and sometimes I don’t know what to answer when they ask me whether they should just pack up their bags and leave the country, just as I did when I was an adventurous, ambitious 20 year old. But now in New York, I often find myself missing France, and the French lifestyle, so I try to holiday there as often as possible. Even then, I see many expressions of France’s current identity crisis and lack of confidence. I have been fortunate enough to spend lazy summer days in Cassis, a sweet Provence town, near Marseille. In a café by the port overlooking the Mediterranean, I overheard a conversation between a middle-aged couple. These educated, tanned, well-dressed locals did nothing but complain about the accent of their Maghrebi domestic workers. The French hate each other’s guts. And most of the time, they don’t even know why. But it’s not just about whites against non-whites. I have been to one of the most idyllic villages in Auvergne, where my wife is from, and heard of farmers who’d physically threatened Parisian visitors. In Paris, I have seen alienated minorities pointing fingers at other alienated minorities, all because of a small misunderstanding that escalated into a violent disagreement. This happens frequently in France. This latest French identity crisis is about more than race, or religion, or even class or provenance. It’s about the French not even trying to get along with—or understand the point of view of—their fellow countrymen. Instead, they prefer to argue aimlessly. All too often, unresolved conflict feels more comforting than fruitful conversation. The French hate each other’s guts. And most of the time, they don’t even know why. So many speak as if they had forgotten the meaning of the national ‘liberty, equality, fraternity’ motto. Suddenly, three years ago, the charismatic former investment banker Macron started to make a lot of noise on the political scene. In a country where so many speak as if they had forgotten the meaning of the national ‘liberty, equality, fraternity’ motto, Macron crafted his public persona as a game-changer and, crucially, one who would push for more French solidarity. He wants the state to focus on creating new types of jobs for the youth, retraining and helping them to start small businesses. He promotes globalisation, modernisation, digital startups and access to culture. He speaks fluent English, advocates further European integration, and has outlined his plans for greater economic cooperation with the United States and with France’s former colonies in Africa. Some of his most fervent evangelists have been comparing him with John F Kennedy in 1960 or, even, Barack Obama in 2008. I spoke with him in Paris last September, at a private French American Foundation breakfast discussion where he was tasked with assessing an elusive French dream in light of the fading American dream. He asserted France’s unique place in the world before speaking, with humility, about what modern France could learn from other nations. He mentioned the necessity of tackling the deep resentment that has been holding France back. I finally understood why some of his most fervent evangelists have been comparing him with John F Kennedy in 1960 or, even, Barack Obama in 2008. Two months after that breakfast meeting, he went to one of Paris’ most impoverished banlieues and announced, in front of a multi-racial crowd, that he was running for President. At that very moment, I became hugely psyched by the new possibilities, and proud of my French citizenship. As we prepare to vote again on Sunday, the choice is now clear. 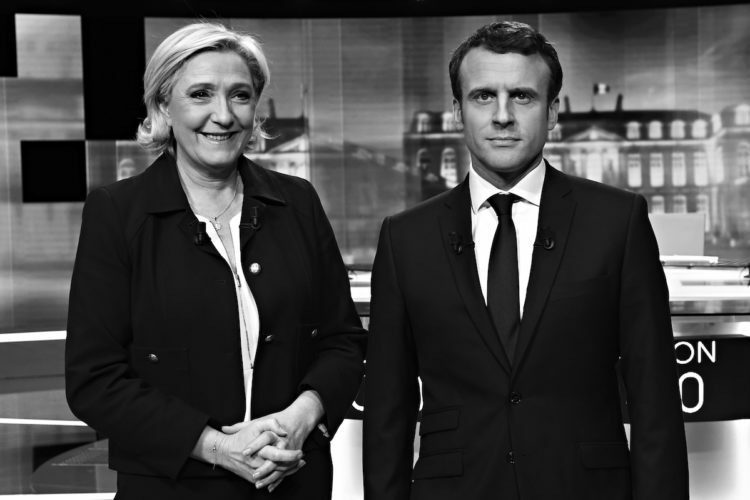 As French citizens who, deep down, will always love France, we now have to choose between a divisive candidate who recently denied the French state’s role in the deportation of French Jews, and a pragmatic unifier, a leader who thinks France will be a stronger nation once it chooses to embrace all of its citizens, as well as the world. I am voting for Emmanuel Macron, because I see him as someone who can make all of us French citizens feel French again.